The dreary and damp apology for the summer continues; weather jokes still abound on Twitter, the latest and best being along the lines of “I thought 50 Shades of Grey was a mucky book, but it seems to be the weather forecast for July”. Foodwise it is tricky. I want to comfort eat; it is so miserable, but at the same time I want to make a nod to summer food, and I think that lighter dishes and warm salads are the way forward. This way I am acknowledging the season but still eating some comforting food. This lovely dish was thought up by my friend Helen and is the perfect use for that bottle of pomegranate molasses that we all have, skulking unloved at the back of a cupboard. 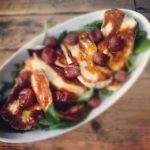 The tartness of the molasses and sweetness of the grape juice make a delicious dressing that works very well with the salty halloumi. Once the oven is heated it takes 10 minutes to get this on the table. The pomegranate molasses grapes are addictive, I’ve made them about 4 times in the last two weeks. If you need an idea to use up the rest of the block of halloumi then try my crispy fried marinaded halloumi. If you try this Recipe: Fried Halloumi Salad with Baked Pomegranate Grapes please tag #FussFreeFlavours on Instagram or Twitter. It is amazing for me when for me when you make one of my recipes and I really do love to see them. You can also share it on my Facebook page. Please pin this recipe to Pinterest too! Thanks for reading Fuss Free Flavours! Place the grapes, olive oil and pomegranate molasses into a small oven proof dish and bake at 200C / GM6 / 400F for about 10 minutes until the grapes are soft. Fry the halloumi for about 3 minutes on each side until golden and crispy. Arrange the halloumi on a bed of salad leaves and spoon the grapes and pomegranate sauce over the top. Red grapes look far more attractive than green, but either work. You can fry the grapes and molasses instead. I free freeze grapes and keep in a tub in the freezer, previously frozen grapes will give a lot more juice, cook them from frozen.